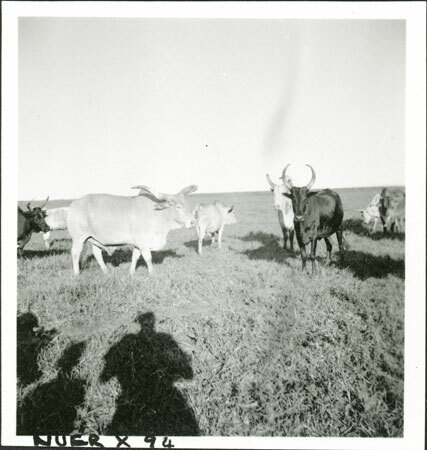 Looking towards several oxen grazing, Evans-Pritchard's shadow in foreground, looking down into Rolleiflex viewer. The ox to the left and another to the right are exhibiting the training of the left horn over the muzzle (ma gut), a process carried out by Nuer men on their favourite beasts by cutting away at one side of the horn, to create an aesthetically pleasing effect. The photograph was taken near Mancom village, the home of Evans-Pritchard's servant Tiop, and where he spent some 4 weeks in the middle of 1935 at the mouth of the Nyanding River among the Gaajok tribe. Note on print reverse ms pencil - "40 2" & print front border ms ink - "NUER X/94"
Morton, Chris. "Nuer cattle " Southern Sudan Project (in development). 03 Jan. 2006. Pitt Rivers Museum. <http://southernsudan.prm.ox.ac.uk/details/1998.355.495.2/>.